Home » Advocacy & Action » What’s coming up? Many people are wondering and worrying about a proposal to reamortize KPERS and rightfully so. We know how important a secure retirement is to school employees and to all Kansans. KPERS benefits are spent by retirees over and over in our communities supporting local businesses and local economies. So we will do everything to protect your retirement. We are following KPERS issues in the Statehouse and working with our many partners – other labor organizations, state and municipal employees, and current KPERS retirees to make sure the right decisions are made. But the first question is, “Why are we here?” Well, it’s a long story starting with the continued failure of many legislatures to meet their actuarial obligations to the system. The unfunded liability grew to a point that lawmakers really began to sit up and pay attention a few years prior to the election of Sam Brownback as governor. Legislators increased employer payments, issued bonds and worked with employee groups to restructure retirement plans without ending the defined benefit system. Then along came Brownback in 2010 and the passage of his reckless tax overhaul in 2012. He and his allies passed tax cuts that put the state on the brink of collapse and drained the state treasury. There was no money for schools, highways, social services, and public safety. And funding for KPERS also suffered. In recent years, the legislature just stopped making payments, offering promises to pay it back but then not doing that. Today, thanks to actions taken in 2017 to reverse the Brownback tax disaster, our state has been in recovery. Revenues are improving and the fiscal condition of the state is looking better. But Kansas is not yet out of the woods. We need time to finish the work started in 2017. Today we have a new governor and Laura Kelly’s priorities are much different from those of Brownback. She has pledged to fund our schools, repair our damaged foster care system, and secure health care for 150,000 uninsured Kansans through Medicaid expansion. Governor Kelly proposed a budget that does those things without raising taxes because she believes big tax changes while in this recovery are not wise. In her budget, she proposed reamortization of KPERS in order to bring down the annual cost (much like refinancing your home loan) so that priorities can be met and the state can have an ending balance as a safety net. You can see Governor Kelly’s explanation of this by clicking here. Everything that is happening now is mixed up with the budget and taxes. And right now there are forces in the Kansas Senate who appear to want to do everything they can to see that Governor Kelly’s priorities are torpedoed. That’s why this week, the Senate passed legislation that takes more than $300 million out of the state treasury before any other decisions are made. Senate Bill 9, sponsored by 18 conservative Republicans, would immediately put $115 million into KPERS. Senate Bill 22, Senate President Susan Wagle’s tax cut bill, will cost the treasury $191 million in mostly cuts for multi-national corporations. Taking $306 million out of the treasury before deciding what is necessary for a responsible budget is irresponsible legislating! Let’s be clear, we would love to see KPERS repaid the money that was withheld to pay for Brownback’s failed tax policy. There was a plan in place to make those payments. If the state had plenty of money and could repay KPERS in full while also funding our schools AND our highways, AND our public safety programs, AND the foster care system, then making the full payment immediately would be the right thing to do. As the situation is now, passage of SB 9 only makes fixing the Brownback damage more difficult. And that is compounded if SB 22 should pass. We would be remiss if we did not point out that there is some serious hypocrisy here. The same legislators who have sought to do away with our defined benefit pension, who made the decisions year after year to not meet the actuarial rate in employer payments, and who voted to strip the KPERS payments out of the budget entirely, now seem to have had an epiphany. Frankly, if one really cared about school and state employees, it would be reflected in one’s votes every day of every year and not just when it might help discredit a governor you don’t support. 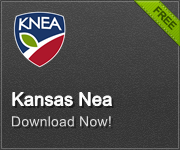 We at KNEA believe in and support KPERS. We have been unwavering in our advocacy for our teachers, our education support personnel, our school administrators, and our friends working in state and municipal jobs. We will continue to fight this fight and work with our friends to protect the system. We want to assure you, as KPERS has, that no benefits are in danger if reamortization passes. Yes, it will take longer to pay off the unfunded actuarial liability but you can rest assured that your benefits are safe. Time for school finance to move? Governor Kelly’s school finance plan, Senate Bill 44, is in the middle of a hearing in the Senate Select Committee on Education Finance chaired by Sen. Molly Baumgardner, R-Louisburg. The hearing began on Wednesday with many superintendents, Schools for Fair Funding, and the Mainstream Coalition all testifying in favor of the bill. The hearing will continue on Tuesday of next week with KNEA, KASB, the PTA, and Game On For Kansas Schools – all testifying in favor. The only opponent, also testifying on Tuesday, will be the Kansas Policy Institute. The most notable testimony came from Schools for Fair Funding (SFFF), representing the Gannon lawsuit districts. SFFF told the committee that should the legislature pass SB 44 without amendment and with no changes to the school finance formula, they would stipulate to the Kansas Supreme Court that the solution met the funding needs of schools providing the Court retained jurisdiction in order to ensure that future legislatures do not renege on the promises made in this legislation. Senate Majority Leader Jim Denning, R-Overland Park, pressed SFFF repeatedly on this issue to make it clear that the bill would be acceptable despite the fact that the inflation factor used in the bill – and recommended by the Kansas State Board of Education – is somewhat lower than the actual Consumer Price Index, or CPI. Here is what is most important to understand: If SB 44 were to pass the legislature WITHOUT AMENDMENT, if no other changes were made to the school finance formula, and if the Court retains jurisdiction (to make sure promises are not broken in the out years), then the plaintiffs and the state would agree to end the litigation. Time is of the essence here. The Court hearing is scheduled for this April 15. Both sides must be ready for that day. Senate Minority Leader Anthony Hensley, D-Topeka, asked Kansas Attorney General Derek Schmidt to weigh in on when he needed the legislature to act in order to be ready. You can read AG Schmidt’s letter to Senator Hensley by clicking here. What can you do? This is the time to start contacting your state senators and urging them to support SB 44 without amendment and to move this process forward. Start with email messages to the members of the Senate Select Committee on Education Finance – Molly Baumgardner, Jim Denning, Anthony Hensley, Bud Estes, Dan Goddard, Dan Kerschen, Carolyn McGinn, Pat Pettey, and Eric Rucker. You can email them using the format firstname.lastname@senate.ks.gov. After you email those committee members, email your local senator using the same email format.